Hot Creek flows through a picture-perfect mix of meadow and mountain. Image by Tom Adkinson. When Hot Creek drops into a canyon, it’s a steep walk to the water.. Image by Tom Adkinson. It’s totally counterintuitive, but that’s still my assessment of three days on Hot Creek and the upper stretches of the Owens River just outside the resort village of Mammoth Lakes, Calif., the community that’s the capital of a massive, multi-sport outdoor recreational area. This is mountain, canyon, meadow, stream, and lake territory. People come to ski, ride mountain bikes, hike, photograph wildflowers and migratory birds, and fish. It is south of Yosemite National Park and about five hours from Los Angeles and three hours from Reno, Nev. The scenery alone was enough to stop me in my tracks, but I wanted to fish. There was promise at the start standing beside Hot Creek. Good stream flow, an excellent trout guide, blue sky. I was with two others. One of them – a total novice – hooked a hefty brown trout while our guide was giving her the most basic fly rod instruction. Of course, she didn’t know how to play the fish and didn’t land it, but that episode was within minutes of arrival. “This is going to be great,” I declared out loud, but that was not to be. Two days and hundreds, maybe thousands, of casts later, the scorecard showed a big, fat zero, and I had no photos of a 20-inch rainbow or brown trout to show off back home in Tennessee. Zero, zilch, nada, nothing, strikeout, goose egg. It’s usually a sad situation when all you can say is that you got a couple of half-hearted strikes. 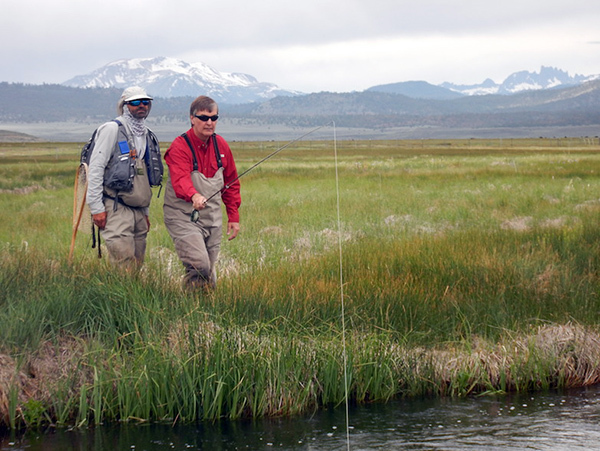 Trout guide Scott Flint coaches a fisherman on the upper Owens River. Image by Tom Adkinson. 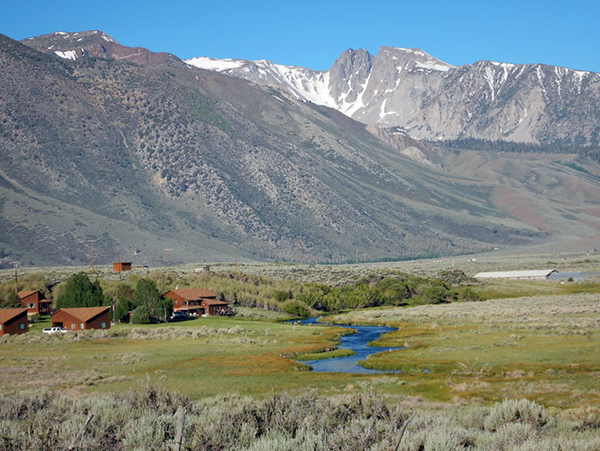 “Hot Creek and the Owens River are modestly sized streams that in places flow through sprawling meadows that collide with snow-capped mountains. In one direction are the Glass Mountains, and in the other are the Eastern Sierra. Mammoth Mountain in the Eastern Sierra tops out at 11,546 feet, and the streams are at about 7,000 feet. It’s almost a challenge to pay attention to the water when the landscape is so beautiful. Hot Creek adds some extra visuals by sliding into a narrow canyon. It’s a serious downhill hike to get to the supposedly trout-laden water. 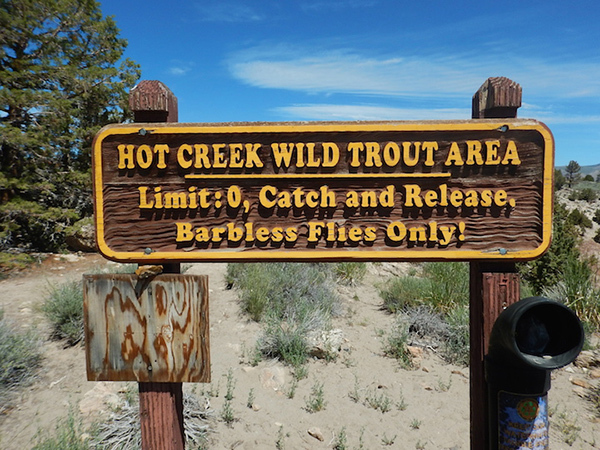 I really don’t doubt trout guide Scott Flint, who said stream surveys indicate 7,200 fish per mile of Hot Creek. 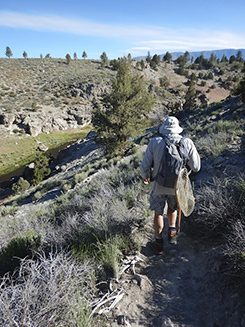 Flint leads the guide service at the Troutfitter in Mammoth Lakes and has been fishing Hot Creek, the Owens River and other area streams and alpine lakes since 1990, so he knows his stuff. He kept my expectations low from the start, although he was confident my friends and I would catch fish. The rules are clear on Hot Creek.. Image by Tom Adkinson.